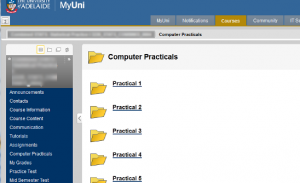 MyUni (known as “blackboard” to people not at Uni of Adelaide), is a powerful tool for supporting your students’ learning. There are a whole lot of awesome things you can use it to do: use discussion boards, have virtual classrooms, set up group assessment, student wikis, and the list goes on. 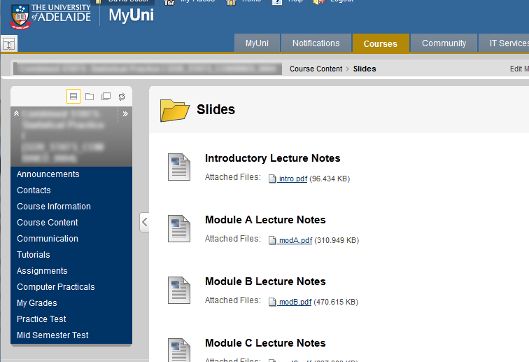 The bread-and-butter of MyUni is of course to put up the lecture notes, assignments and prac instructions. And this brings me to the most important thing you can do in MyUni to make your students’ lives better: label everything properly. And not just any labels — descriptive labels. Imagine yourself as a student doing your assignment and needing to remember how to, say, produce a QQ plot in SPSS. You remember that you had a computer prac at some point in the past where you learned to do that, and that the prac instructions told you how. 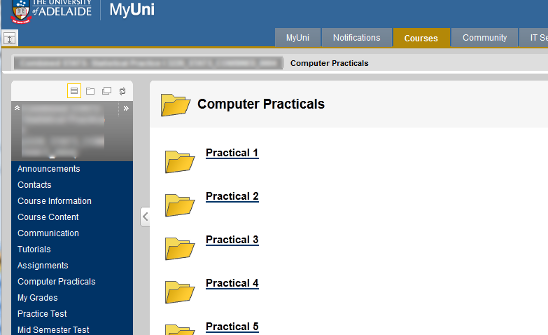 So you go to the part of MyUni where all the prac instructions are. And you are faced with the following picture to the left. And now you have to go through every prac one at a time, dowloading one pdf after another, to find where the instructions are. You have an intense feeling that perhaps it’s just not worth it. Then you as a student would be able to find the instructions yourself and not have to ask for help, or worse, just give up. Imagine yourself as a student studying for your exam. You have been going through your assignments and you find that you really need to go over the topic “integration by parts”. So you decide to go and watch the appropriate lecture recording. You go to the part of MyUni where the lecture recordings are and you see the picture to the left. There is a list of the lectures at the bottom, but they are organised by date. You don’t have dates in your own personal lecture notes because you organise them by topic, since that fits with your learning style. How on earth are you supposed to know which one is the one about integration by parts? You’re not about to watch the first ten minutes of ALL of them to figure it out! You know it’s one of Module E, F or G, but which one? If only there was a description of what was in each lecture, you might actually be able to choose which one. And in fact you might possibly get an appreciation of what the whole course looks like since the topic list would be right there. As it is, you waste precious time, and vow never to lend your notes to your friends ever again. Do you see how important this one thing is? Do you see just how annoying it can be for a student to have to deal with a lack of labelling, and how it can actually seriously impede their learning? Do you see how proper labelling might actually smooth the way for the students to become more independent? This is why I think it is the one most important thing you can do to label everything properly. Lecture notes, lecture recordings, practical notes, assignments, tutorials — everything. It really will help your students learn more than you will ever know. So please, label everything clearly in MyUni! This entry was posted in Being a good teacher. Bookmark the permalink. Great advice! As a former student and now a MyUni Admin I’ve been in to many courses, and agree completely with the 3 examples! In MyMedia a lecturer can include notes when they record. 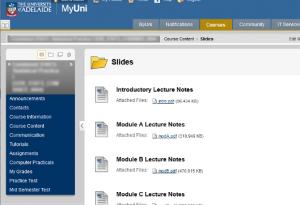 There is a notes field on the MyMedia Capture Application in lecture theatres, and on the file upload screen of the website. You can enter as much or as little text as you like. 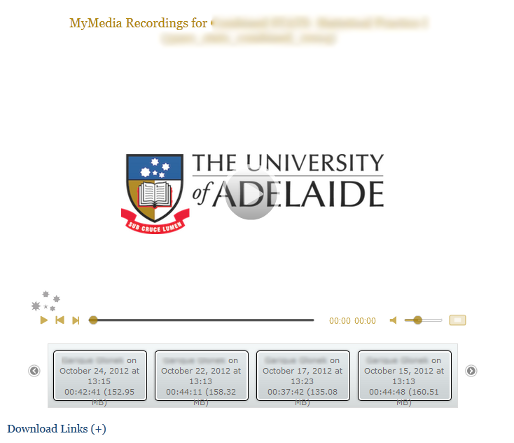 This text is then viewable and editable on mymedia.adelaide.edu.au with the other session editing capabilities. This text is then automatically included when you embed an individual session on a page. We experiemented with a few ways to get the note text on the playlist, but because of the arbitary size the text could be, it was tricky to keep the playlist a certain size. Just showing the note of the current playing video was investigated, but it didnt really solve the problem! However, if you click on ‘download links +’ below the playlist, you get the download links, with recording names and the notes! The recording names match up with the names in the playlist, so you can locate the right one and select it. The next iteration of the playlist will hopefully include the notes inline, reducing the step of expanding the download links to read them!